Home 2013 An ecumenical matter! 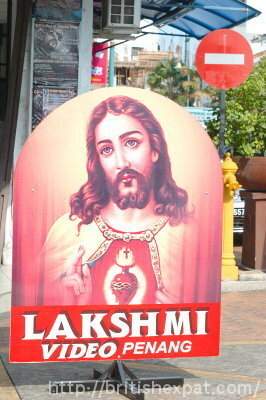 Sacred Heart sign advertising the Lakshmi Video shop in George Town, Penang. “This sign somehow seems to sum up Penang’s ethnic diversity very well. You’ve got a Christian iconic figure, rather bizarrely advertising a shop named after the Hindu goddess of prosperity, in a largely Chinese city in an Islamic state. Confusing, but Penang’s people seem to rub along together well enough most of the time. This entry was posted	on Tuesday 30 April 2013 at 09:35	and is filed under 2013, Malaysia. You can follow any responses to this entry through the RSS 2.0 feed. You can leave a response, or trackback from your own site.